Let’s not bury the lead. Last week, I tried out ConvertKit on a new blog I started and was able to get 600 email subscribers via two blog posts. I utilized Brian Dean’s Skyscraper technique & SumoMe’s Pro popups as well, and when I tell the step-by-step process, it’s probably going to shock you that it was this simple. In addition to helping businesses optimize their websites, I share my insights on sites like KISSmetrics, Crazy Egg, Conversion Scientist and Sitepoint. Over the last few months, I began noticing the name ConvertKit popping up a lot on popular blogging and email marketing hubs. Why? I didn’t know, so I decided to check it out. Here’s what I found. ConvertKit allows you to do all the stuff we talk about on prestigious marketing blogs without the thousands of dollars in automation tools. Before ConvertKit, if I wanted to offer a variety of different email-for-download options within a single blog post, I’d need something like InfusionSoft, which runs $199/month at its cheapest option. You’ve probably read 100 blog posts on content upgrades and other great strategies for increasing your email subscribers, maybe even from my own blog posts, but if you are using something like Mailchimp, Aweber or GetResponse, you simply aren’t able to implement the necessary automation to run these techniques. ConvertKit gives you InfusionSoft-like capabilities for essentially the price of Mailchimp. 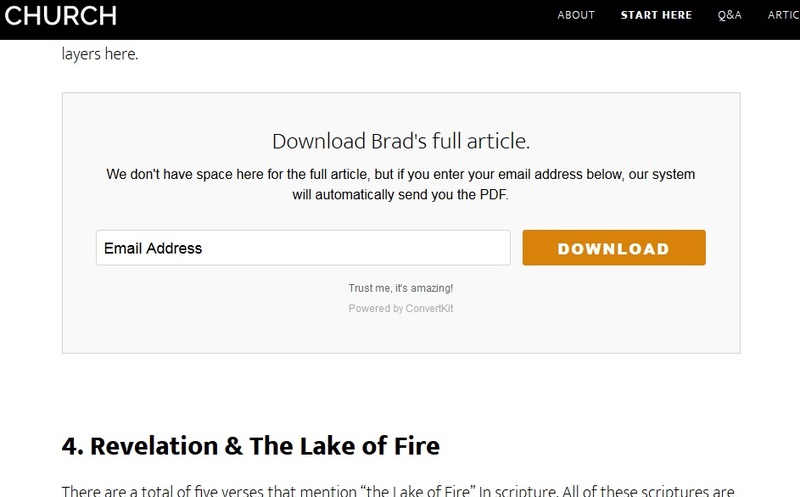 It let’s you do everything I’m about to show you en route to 600 subscribers in two blog posts. So let’s start with the articles themselves. The blog I had started with some friends is on Christian theology…. aka not the catchiest topic. But, it is a NICHE topic, and that’s important. Awhile back, I started a humor site making fun of Christian dating. My launch article got 17,000 visitors in the first few days from organic Facebook traffic alone. It also got only 30 subscribers, so I turned the article into an ebook and promptly scrapped the project. I wish I had tried ConvertKit then as I might have had some different results. So for this new blog, my goal once again was subscribers, and I decided to use the Skyscraper Technique to build momentum. The Skyscraper Technique is a term coined by Brian Dean to make content that is better than existing popular content. Basically, you find something people are sharing and make it even better. 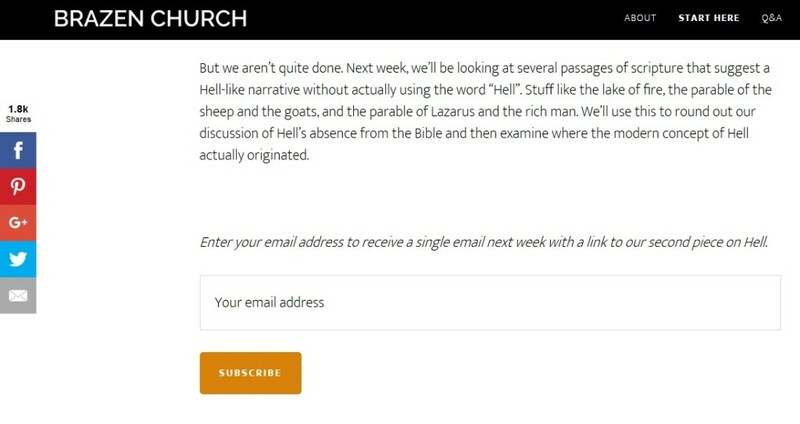 I had been wanting to debunk the idea of Hell on my blog, and after looking around the web, I found that articles on Hell tended to be popular, so I decided to start there. Again, you’ll notice this isn’t an example about how I built links writing about building links or got email subscribers writing about getting email subscribers. Forget the meta. This topic couldn’t be further away from the marketing niche. Now, here comes the hardest part of the whole story. I wrote 7,316 words over two posts on the topic. I probably spent 25 hours on these… easy. 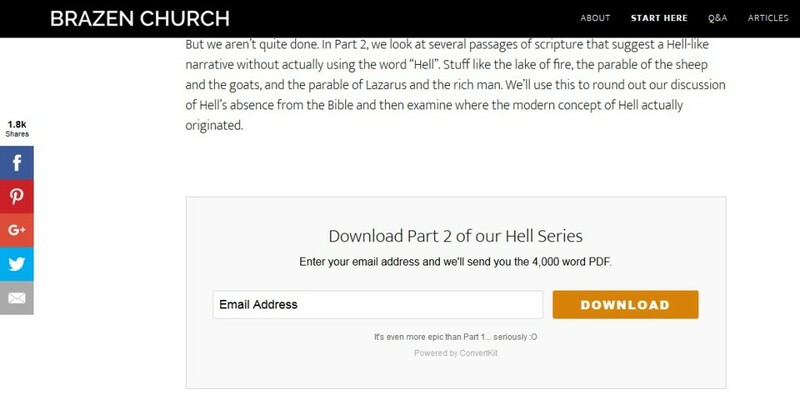 My primary goal with this blog wasn’t to get views; it was to provide exceptional theological content, so I did everything I could to make this the most researched, most exhaustive, most well-written post on the topic of Biblical Hell that I could find online. At the end of Post #1, I informed the readers about Post #2 and included a simple option to receive an email the following week when the post went live. If you haven’t used SumoMe yet, they offer a free suite of tools to help you build your email list. I like it so much, I’m using the Pro version, but you should at least give the free version a try. Now that my initial setup was completed, it was time to promote. I didn’t really do anything fancy with promotion. In fact, here’s everything I did. After the blogs started picking up traction, I spent $20 for ~200 FB click-throughs. That’s pretty much the extent of our promotion. My teammates and I have developed enough of a community on Facebook, that shares picked up pretty quick and around half of the articles’ 20,000 page-views came from Facebook. 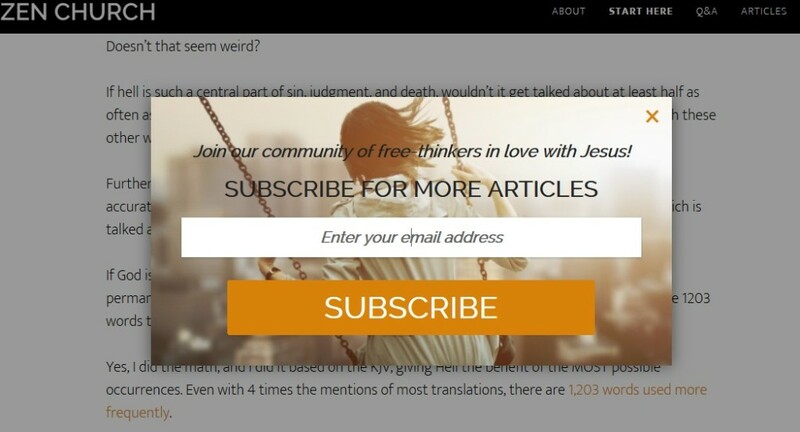 Considering around half of the people visiting our site probably hated the article (it makes conclusions contrary to mainstream Christian belief), 1,800 social shares and 600 subscribers is a pretty good takeaway. So here’s where ConvertKit comes in. For the first post, I just used the basic signup form pictured above, with a pretty solid response. After the 2nd post went live, I turned that post into a PDF and replaced the signup box in Post #1 with the following. This easy-to-setup form from ConvertKit allows me to send a unique download link to anyone who signs up. While I can use it in multiple places, creating new forms for each spot on your site allows you to see exactly where your subscribers are coming from. 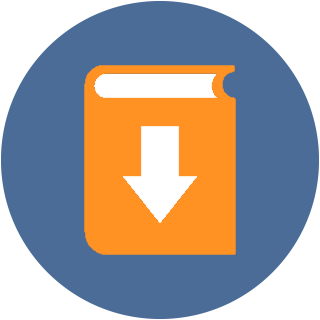 I utilized another one of these forms in Post #2, offering a different download that expanded on one of the more compelling points in the article. When I’m done with the series, I’ll use one of ConvertKit’s other forms to create a pictorial form like this (pictured from my men’s blog) and allow users to download the complete 3-part series as a single PDF. You’ll notice that the signup forms conform to your site’s CSS for a streamlined view. They can also be easily customized with unique CSS. 600 email subscribers is FAR more than I’ve gotten from any blog post before. Here were some of my key takeaways for use in your own email marketing strategies. You’ll notice that between basic popups and forms, I would have acquired 350 email addresses. That’s because the article was great and it was well-targeted. But with ConvertKit, I was able to increase that article’s productivity by 40%. That’s a BIG increase. 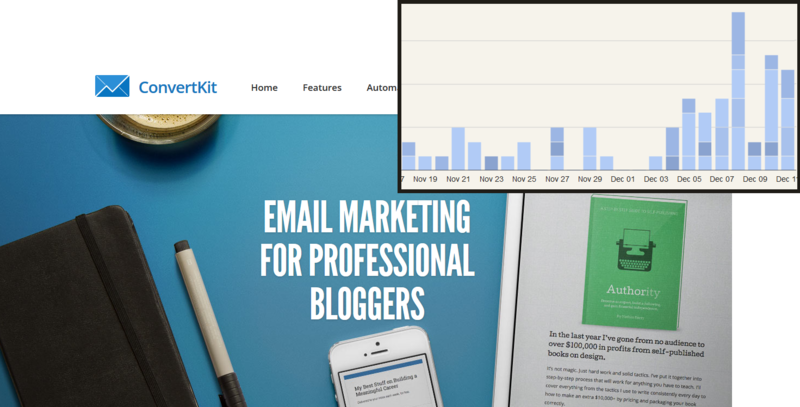 If you are serious about skyrocketing your email subscriber numbers, give ConvertKit a try. 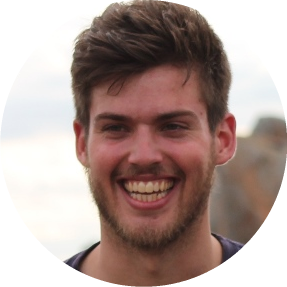 Love this case study, Jacob! So glad you’re using ConvertKit to it’s highest potential and seeing the benefits. Great post Jacob!! I still need to write an article for your men’s site. Great post Jacob! You mention using both ConvertKit and Sumo. Do you have an opinion about choosing just one option? It seems ConvertKit has everything you need to create, build, and manage all your email list building activities. Hey Chad, they are two different tools. ConvertKit is an email service provider with limited lead capture capabilities. SumoMe is a lead capture tool with limited emailing capabilities. At this point, I’d recommend using SumoMe for lead capture and an ESP with better data tracking like Mailchimp or GetResponse.